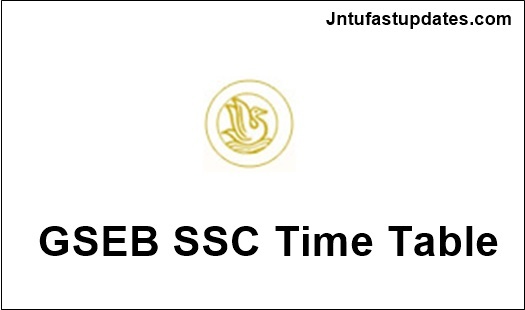 Gujarat Board SSC Time Table 2019 PDF: Gujarat Board of Secondary Education (GSEB) has released the SSC/10th Class exam time table 2019. Students can download GSEB 10th Class Date Sheet at www.gseb.org. Students waiting for the Gujarat SSC Examination Dates 2019 need to wait for a while. According to the schedule the SSC examination will begin March 7 and will end on March 19. Gujarat Board of Secondary Education (GSEB) is the state level education board monitors secondary and higher secondary education in the state. The GSEB Board conducts classes and examinations for students every year. The GSEB striving to offer quality education for the students. This board is functioning since 1960 in the education sector. Every year millions of students obtaining their certification from this board. The Gujarat Board annually conducts the SSC and HSC examinations in March/April months and releases the results in May month. The GSEB conducts the academic examinations in March month. The GSEB board hao announced the Gujarat SSC Date Sheet 2019 in the month of December. Soon after the time table release, students can check the subject-wise exam dates and exam timings from it. Students can visit the GSEB Official website, gseb.org on regular basis to check the latest updates from the board. For more information go through the following article. SSC (Secondary School Certificate) Examinations will takes place in the month of March. Official time table will be release in December. Last year the Gujarat Board has conducted the SSC examinations from 12th March to 23rd March. This year exams starts from 7th march to 19th march 2018. The GSEB is going to announce the Gujarat SSC Date Sheet 2018 in the month of January. Also, the board announces the admit card download dates along with exam dates. Students appearing for SSC examinations in Gujarat state can get ready for the board examinations by preparing the subjects well. Stay visiting the GSEB Official website, gseb.org to check the time table and exam dates. On the homepage, GSEB 10th Exam Date Sheet/Time Table 2019 Link appears; Click on the Link. Std 10th july exam time table??? Request for Re-Exam of Maths. How to check exam center by name? ?